Pork Schnitzels, my friends! This is where it’s at! This post is all about pork, if you’re no pork lover, then you will want to leave now. But, if you’re like me, loving and embracing everything about pork, then let’s be friends and share in the love together. Pork is the meat I grew up on. Bacon, pork chops, schnitzels, pork roast, pork ribs, pork anything, you name it, is what I’m all about. Yes, I live in Alberta where the beef is the best and I am known to enjoy a great big juicy steak every now and then, but my first love will always be the good ol’ pork. This story is about the schnitzel, a boneless meat, thinned with a meat tenderizer, coated with flour, beaten eggs and bread crumbs, then fried to a crispy perfection. The traditional recipe requires veal but you can make schnitzels with any kind if you so desire, but pork is by far my favorite. The secret is in… actually, in cooking. I mean, it is definitely fun to beat the crap out of that pork with your meat mallet but that is not all that’s required to make a great schnitzel and I know this because I have been trying for years and for some reason, I could never get it right… until now. 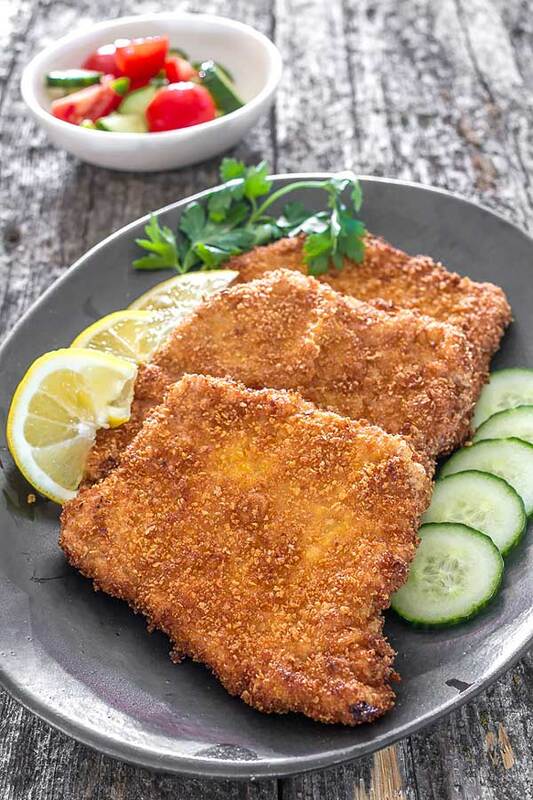 This is the most delicious pork schnitzel I’ve ever had, it will literally melt in your mouth and freshly squeezed lemon juice is mandatory when serving. But you don’t have to believe me, go try this yourself, then you can come back and thank me and we can further talk about pork love. Cheers! Trim the fat and get rid of the bone, if any. Pound each pork chop until just ¼ inch thick with the meat tenderizer. Lightly season both sides with kosher salt. Heat the oil in a large skillet on medium high heat. You need enough oil so that the schnitzels swim in it, about ½ inch. Place the flour mixture, egg, and breadcrumbs in 3 separate large plates. Dip the chops in the flour, the egg, and then bread crumbs, coating both sides. The bread crumbs must not be pressed into the meat, so that they stay dry and become crispy when frying. The cooking oil has to be very hot so make sure you turn the heat onto medium and give it enough time before throwing the meat in. If you rush and use high heat, the whole oil is gonna jump onto you. Fry the schnitzels for about 30 seconds per side or until they become deep golden brown. A good technique is to repeatedly slightly toss them around and scoop oil from the pan with a spoon and pour onto the meat.Transfer briefly to a plate lined with paper towels though you might not need to, my schnitzels were not greasy at all.